The plan presented by Vanvitelli on sixteen tables engraved on copper does not only include the royal palace and its dependencies, but outlines the plan and physiognomy of the new city which was supposed to rise beside it. It marks the streets connecting the nearby villages, and traces the backbone of the project, the gran viale between Naples and the great waterfall that gushes from the hillside of Briano, intending to make an virtual connection between the new capital and the far away metropolis. The road was to pass through the royal palace, the point of reference and unit of measure for a composition without confines, it being dominated by the building's squared bulk and volumetric grandeur. 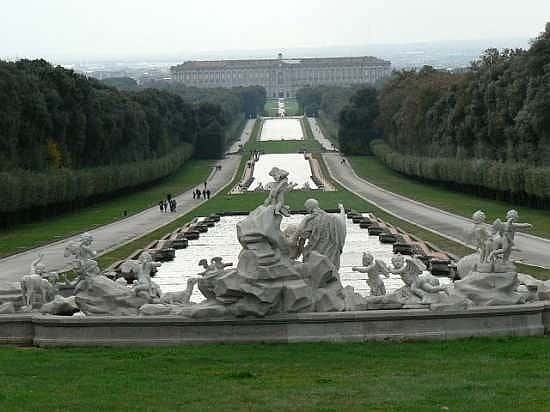 The palace was linked symbolically to Naples by the white ribbon which starts from the waterfall and seems to mark the route taken by the water to reach the capital. The viale was supposed to be skirted by streams, derived from the caroline aqueduct, but this was never realised. Charles of Bourbon made a notable contribution to the working out of the general design, and even more so Maria Amalia of Saxony, who personally chose the cloths and decors. The sovereigns, together with the architect, verified the main perimeters of the foundation, the routing of the avenues, and the plantations already in place. The initial presentation of the project designs to the sovereigns is described by Vanvitelli in a letter of 22 may 1751 to his brother Urbano. According to the planner, the building was to have an ionic frontage with the entrance design larger than the rest of the façade, to give it more prominence. In the centre, the main courtyard is surrounded by four smaller ones. Two magnificent staircases were placed symmetrically in the central courtyard. The exterior of the palace has a grave and solemn aspect. Gone are the castellated turret references of the first project. Instead a modern palace emerges in there exist no prominent structures that may diminish the importance of the central body. beyond the decorative particularity of the pilasters, the number of which changes according to whether it is the external frontage or the one facing the park, the facades have a similar structure, strictly in line with the plan. The structural units, intersected at right angles to one another, have their apexes extended a little beyond the perimeter line, giving rise to articulations accentuated by the pilasters of these elongated apexes. Vanvitelli deliberately neglected the external portals in order not to spoil the consistency of the stylobate, and to give prominence to the upper floors. 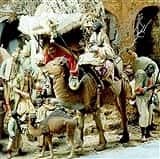 With the solemn ceremony of laying down the first stone on 20 january 1752, 090 the construction of the royal palace was begun, requiring around 4.500.000 ducats for the building work alone. The technical administration consisted of the director general and two assistants. Pietro Bernasconi was the supervisor of a huge line-up of workers, among which were women and children, alongside convicts sentenced to hard labour and slaves. The programme suffered enormous delays to its expected 10 year schedule, due to a variety of events that occurred in the course of years. In 1759 charles left Naples for Spain. This slowed work down and extinguished Vanvitelli's enthusiasm somewhat. In 1764 there was a forced stoppage caused by famine and the epidemic that followed it. And in march 1773, Vanvitelli died. The work was still far from completion, when his son Charles took over. Though he sought to remain true to his father's designs, he did not succeed in bringing it to a close per the plan. 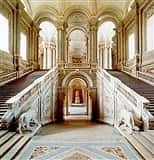 One of the most delightful Vanvitellian innovations is the use of galleries and vestibules aligned to the axis of the building, and the aesthetic and practical purpose given to them, intrinsically connected to the development of the main design. The internal circulatory system is perfectly achieved with radial passages which connect the vestibules to the courtyards and with the entrance halls which in turn link the courtyards with each other and the exterior; a balanced network of passages and squares which facilitate the performance of parades, balls, processions, and banquets, without confusion, blockages or accidents. The vestibules are peristyle octagonals, capped by column-supported vaults. the central one is very wide and bright. On the right is the royal stairway; on the left, the statue of hercules balanced on a plinth. Opposite, against the green background of the hills, the waterfall glints in the sunlight "that crystalline obelisk, upright upon its fantastic base consituted by the white ribbons of the avenues" (G.Chierici, la Reggia di Caserta, 1930). The courtyards, as wide as squares, are seen through the arches of the gallery. 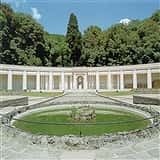 They also have a function in accordance with the canon of vanvitellian architecture. In the royal palace of Caserta, the place of the courtyard is taken by the axial gallery, offering a deepened perspective, where the four courtyards are sources of light, places of transit or for lingering; factors necessary in the playing out of life at court. They permit the ingress of the roads into the building, making them places no longer closed in on themselves. The entire complex suggess the idea of order and symmetry, a sort of "state classicism", as charles had in fact intended. but it also conveys strong integration between central power and the state administration, between the court and its subjects. This relationship between the building and the park, created by means of the gallery-telescope and constituting an integral part of the fabrication, appears clear and rigorous: against the emerald background of the lawns, the white avenues stand out. the mass of trees, open in the middle, show the expanse of water in the distance, modelling itself to the contours of the land. In this sober, austere tableau, the spirited architecture of the palace appears in all its monumenal worth, in which space, colours shapes and surfaces unite in unmatched unity of expression. The building has a rectangular plan, closing on four courtyards which are also rectangular. It is 36 metres high and has five storeys in addition to the underground level housing the kitchens, cellars and workshops, ingeniously lit by external light. on the outside it presents a ashlar base, two storeys adorned with half columns and fluted pilasters, and a final level skirted by a balustrade. The main facade has three vaulted entrances, 2 doorways and 243 windows. On the entrance there is an alcove containing an epigraph in memory of charles and ferdinand. the façade giving onto the park is similar, but even more ornate, with fluted pilaster framed windows. The architecture and design of the royal stairway represents one of Vanvitelli's most delightful innovations, beginning from its location on the right hand side of the central entrance hall, it leads up to the upper central peristyle, which opens into both the chapel and the two lines of antechambers from where the royal apartments are accessed. The brilliantly illuminated stairway proceeds in a great central flight, hewn from a single block of marble. Then, starting from a half-landing presided over by two marble lions symbolising the power of reason and force (the work of Paolo Persico and Tommaso Solari), it divides into two parallel flights. Its magificence owes to the colour of the select marble used for the pilasters, the elegant vaults gathered together in a cupola, the arches and cornices, and the three archways linked to the stairway like a pronaos, making it a singular example of its kind. The immense ethereal vault opens in the centre through an oval oeil-de-bouef, constructed not only to house the invisible choir loft, but also to frame the central part of the upper dome. The false vaulted roof is made from a woven cane flat fastened to the curve, and suspended from the roof truss by wooden braces. Imagination, art, technique and courage have all contributed to the creation of this work, and one can well imagine the difficulties encountered, and masterfully overcome during its realisation. The stairway is lined with cipolin marble, while the sides of the central flight and the walls of the salon are finished with sicilian marble, from vitulano, bardiglio and carrara. Vanvitelli had planned to distribute eight apartments on the royal floor 105: one for the king, one for the queen, two for the royal princesses, two for the second born princes, and one each for the hereditary prince and princess. During the construction of the palace, the royal family lived in the baronial palace, today the seat of the prefecture. The apartment for the second born offspring was completed around 1780, and the sovereigns duly moved into it. In 1783 another apartment was completed, and in order to speed up the work, the king decided it would have pictures similar to the existent ones in the princesses' quarters. This part of the palace took the name old apartment, to distinguish it from the subsequently completed new apartment, finally finished only during the reign of Francis II. 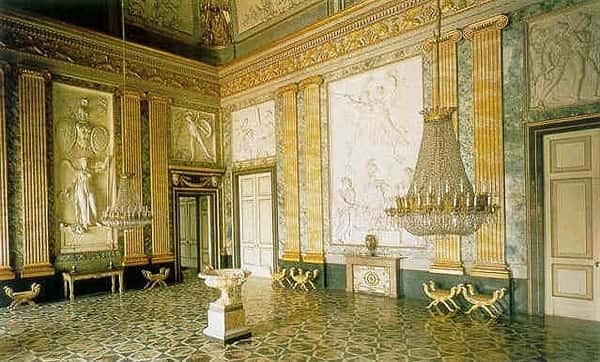 The royal apartments begin with the Albarieri Salon, whose walls are discreetly pannelled in stucco. The intense light in the room accentuate the dark brown of the stone, the gold of the crowns, the festoons and bourbon obelisks, and the warm tones of the canvas of the central vault decorated by Domenico Mondo in 1785, representing the triumph of Bourbon arms. The second antechamber, that of the guard of honour, is more lavishly adorned with stucco: groups of cherubs fly from the vaults bearing banners; doors and windows are overlaid with haut-relief panels depicting historical scenes that have taken place in the realm in ancient times. Opposite the windows there is a group of marbles portraying Alexander Farnese crowned by Victoria. The last of the antechambers is dedicated to Alexander the Great; the marriage of Alexander and Rossana appears on the vault, and episodes from his life are featured on the bas-reliefs of the stuccoed walls, commissionedby Gioachino Murat during his reign, and two canvases recalling the founder of the dynasty: Charles of Bourbon depicted at the battle of Velletri, and the abdication of Charles in favour of his son. In comparison to its original design, the room has experienced many misadventures on the way to its completion, but it is worthy of its place in the palace with its granite surfaces, bas-reliefs, its painted vault, and the portait of Alexander on the fireplace medallion. The picture gallery is in reality a series of rooms in which many paintings have been gathered: still life from nineteenth century italian and dutch artists, paintings of battles and wars. the portraits of the Bourbon familie, both of Italy and France, are gathered in the frame room, that includes various halls, where portraits of Charles and Maria Amalia may be admired, official pictures of the newlyweds, two large canvases by Francesco Solimena, Filippo V and the portrait of Charles III mounted on a horse at the battle of Velletri, 1744; the genealogical tree of the Bourbons; the family of Francesco I by Michele Cammarano, in which the king is portrayed with his second wife Isabella of Spain. The head of the family Filippo V and Elisabetta Farnese are portrayed in two paintings attributed to Giovanni Battista delle Piane, known as the Molinaretto. 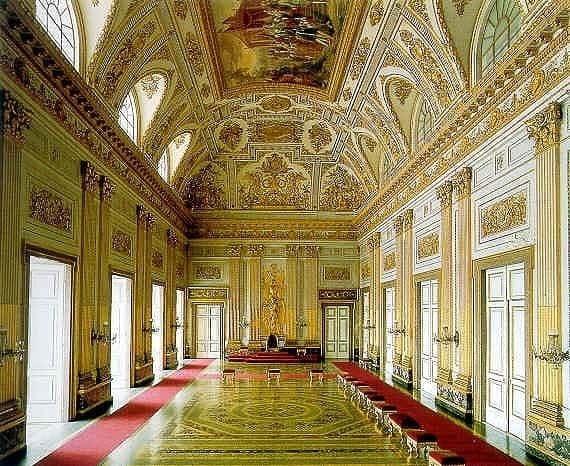 a whole hall is dedicated to Ferdinando IV and to his wife Maria Carolina; another is reserved for the king Ferdinando II, nicknamed "the bomb king" after the slaughter in Palermo in may 1849. there are also the portraits of Maria Cristina di Savoia, the "Saint", daughter of Vittorio EmanueleIi and the first wife of the king, who died giving birth to Francesco II, of Maria Teresa d'Austria, whom he got married for the second time, of Maria Sofia di Baviera, the wife of the last king of a dynasty that lasted 126 years. In the old apartment we find an elliptic room, painted in white and without decorations, with footstools for the musicians, because the hall was destined for the amusement of the count. Today it hosts the nativity scene, recently restored, after the major number of pastoral statues were stolen. The tradition of the Neapolitan nativity scene became popular during the Bourbon period of Charles, but mainly by the collector Francesco I. The custom of staging a nativity scene for Christmas was popularised at the Caserta Royal Palace as a collective activity of the court: not only did artists and artisans participate, but also the ladies in waiting and the princesses, skilful in making clothes for the pastoral statues, rich noble women or oriental dressed georgian merchants, with multicoloured silk and jewellery of filigree and coral. many artists participated in the production of the nativity scene such as Bottiglieri, Sanmartino, Mosca, Celebrano, Vassallo, Gori, they modelled the more important figures into clay while other statues had the head and limbs in clay and the body in wire and oakum. 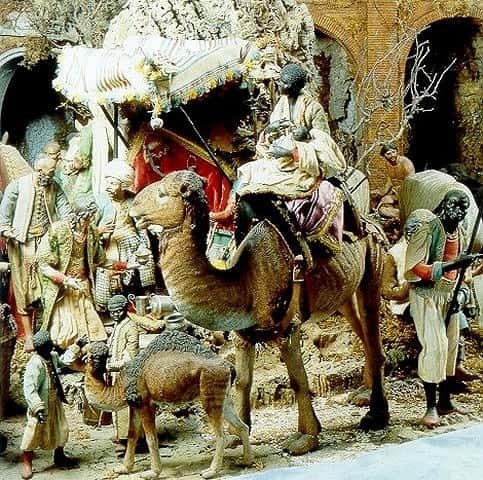 The statues were placed on a bed of cork, according to strong rules respecting canon scenes, like the nativity, the announcement to the shepherds and the inn. In order to implement the nativity scene, every year a project was carried out as described in the paintings by Salvatore Fregola on the walls of the hall; these paintings portray the last nativity scene to be stayed by the sovereigns, before the fatal events that brought about the bourbon downfall, wanted by Ferdinand II by preparing the "racket hall" and by having all its walls painted "like the sky". The current presentation is inspired by the last nineteenth century nativity scene, that represents better the cosmopolitan eighteenth-century Naples. In the queen's rooms there is a change in style due to the intervention by Carlo Vanvitelli as director of the work: uncertain about style to choose he adapted both baroque and classicism. The palatina library is entirely in classicism, contrasting the artistic masterpiece that is the queen's bathroom. 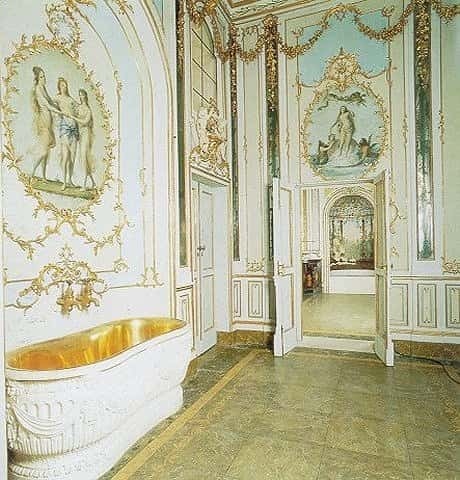 The toilet was very important, carefully and coyly decorated: venetian mirrors, Venus, Diana and the Graces painted by Fischetti on white, blue and pink backgrounds, cupids modelled by Gennaro Fiore and, in the niche, the marble tub sculptured by Salomone, lightened by the oil painting vine-leaf hurdle. 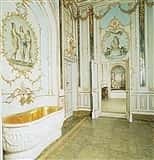 The queen's rooms are well taken care of in the furnishings; the work room has a great decoration, yellow satin framed with mirrors from the royal factory of Castellammare; the second room, known as the stucco, has mirrored walls and festoon shaped stucco in white and gold. In the order to furnish this room the chairs known as "à la duchess" were invented, made by Gennaro Fiore. The three rooms of the library belong to the queen's apartment. 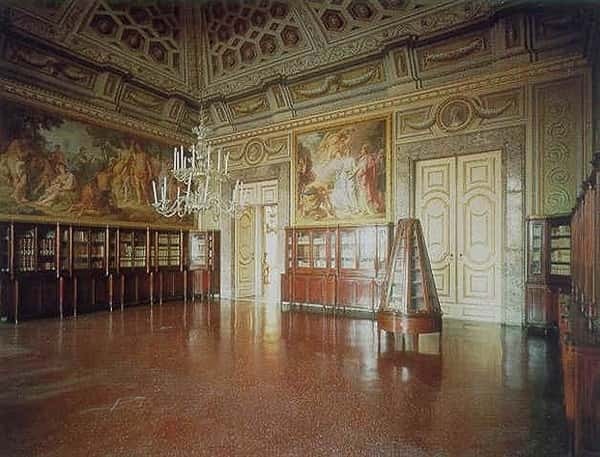 The library was desired according to tradition by the queen Maria Carolina, a woman of culture and of refined taste. For the decoration of the walls a german artist was called to court, Heinrich Friedrich Füger. Füger represented the new, the modern, the classicist painting in contradiction, that is why he chose items that were deduced from his vast repertoire to decorate the walls of the library: the Parnaso with Apollo and the tree Graces, the envy and the richness, the Athens school, the protection of the arts and the banishment of the Ignorance. The themes of the iconography are divided into four scenes that cover the history of humanity celebrating a new Bourbon "era of gold "; because of the connection between Maria Carolina and the freemasonry, some scholars read in these scenes clear references about the interpretation of the human progress in the masonic thought. The decoration of the fresco in chiaroscuro in the first hall was carried out by following Carlo Vanvitelli designs, is in "pompeian" style, inspired by the artefacts from Pompei and Ercolano. All the other libraries are also in Neoclassical style carried out by local workers like the revolving library in mahogany and rosewood, placed in the middle of the room and created in order to facilitate the queen's reading. In the reading room, two oil paintings, one by Vernet portraying Charles of Bourbon hunting coots in Lago Patria and the other by S. Fergola portraying the inauguration of the railway Naples - Portici. The library was founded in 1768 and contains about 14000 volumes and booklets. In order to get to the palatina chapel you move through the lobby, without entering the royal apartments. More than a place for prayer, it seems more of a reception hall, due to the lack of pictorial decorations and the abundance of precious marble. The chapel was clearly inspired from the Royal Palace of Versailles, that must have captured the king eye. A tunnel shaped hall full of pillars that rise to a high stylobate. 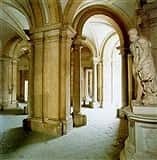 The superior gallery, where the high dignitaries and ladies in waiting stayed, has a balustrade in marble from carrara and from dragoni, on the pillars there are sixteen columns paired in corinthian marble from Mondragone. On the wall in the entrance there is the royal dome with the walls decorated in yellow castronuovo and renewal of the marble from Mondragone; you access it from a spiral staircase. A stuccoed altar was intended for the apsis, but was never realised accordino to Vanvitelli design, which included an ancient marble urn ornamented with agate stones and gilded bronzes. In the curve of the apse, is situated a large altar by Giuseppe Bonito portraying the Immaculate Conception, while on both sides are placed the organs that were destroyed in the bombing of september 24th 1943, in which all sacred paintings and furniture were lost. The palatina chapel was inaugurated at Christmas 1784, during the midnight mass celebrated in the presence of Ferdinand IV and all the court. The court theatre is the only hall of the palace completed by Vanvitelli, even if the work took longer than expected, because the architect was contemporarily constructing the royal palace, the carolino aqueduct and other works in Milan and Benevento. It wasn't planned on the original project, as a result its construction began in 1756, three years after the work began on the royal palace. It was inaugurated in 1769, during the carnival, in the presence of Ferdinand and Maria Carolina. 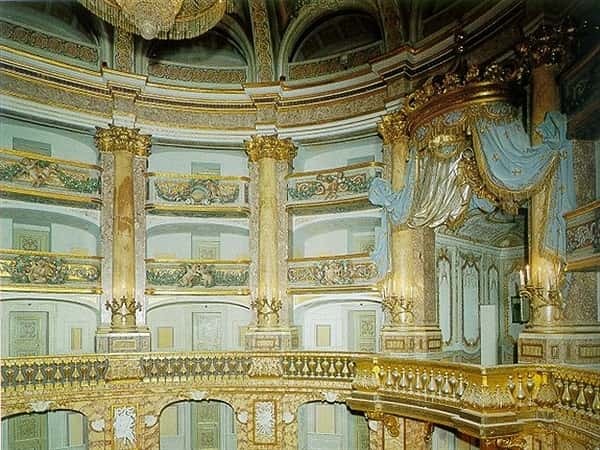 The theatre is the exact reproduction of the San Carlo theatre of Naples. Situated in the west side of the palace, it had three entrances: one reserved for the king and his court leading directly to the royal box, while the side entrances were reserved for the guests and the public and through two semi-circular staircases, leading to the stage. The theatre offers an image of great elegance and composite balance. The plan is the classical horse shoe shaped, as in the wide royal staircase on high stylobate in imitation marble rise the alabastrine columns of gesualdo. Among the columns, 42 boxes in imitation marble placed in five rows, all decorated with cupids and floral festoons, but each one different from the other. The royal box in height three rows of boxes, and mounted from the crows held by the fame that plays the trumpet and by a rich drapery in paper maché, taken back to the original Bourbon blue with golden lilies from recent restoration, after the Savoia era it had been covered in a carmine red. In the gore vault, sustained by pillars in red gravel from Atripalda and twelve semi-columns in alabaster, the centre painting portrays Apollo that steps on a python, portraying king Ferdinand stepping on the vice, carried out by Crescenzo la Gamba, like the frescos on the vault portraying the nine muses and those of the four elements. The golden balustrade surrounds the entire hall. The stage is capable of creating a natural scenic effect by opening a door in the back that leads to the box. The opening was created in 1770, for the production of "Didone" by Metastasio with the San Carlo company, to create the realistic effect of the fire in the last scene. The realisation of the opening door was due to Collencini. What remains as testimony to the splendid past, is the large back-drop in the theatre, portraying Ercole Farnese inside a beautiful garden. The territorial and Vanvitelli museum finds a convenient location in the dungeons of the royal palace, very sensibly fitted for the exhibition demands, while leaving the original structure untouched. Objects supplying documentary evidence of the whole Vanvitellian life, work are shown together with documents about the Caserta area, the royal palace being its most meaningful expression, and about life in the Borbonic court between xviii and xix century. The museum also contains a number of art works previously stored in superintendency warehouses, now brought back to public enjoyment in the territorial museum rooms. The park is divided into three areas: the first one, situated to the rear of the palace was intended to be a flower garden, but eventually became a simple green lawn dissected by straight white avenues. Also included to the left are the "old woods", so called because of their existence prior to the construction of the palace. On the right is the meadow, hemmed by a band of trees. The second area extends to the foot of the waterfall, where the wood-covered Briano hills rise. A fundamental element of the park are the water patterns which spring from the fountains, realised under the supervision of Carlo Vanvitelli. The third area, which was not part of the original plan, comprises the english garden. According to the Vanvitelli design, the park of the royal palace had to keep the same impressiveness as the palace. he had studied the projects of his French, Dutch and German colleagues and he knew very well the parks and gardens of Versailles, Fontanbleau and Tuiliers: he planned for a boulevard, long three kilometres from the royal palace to the waterfall, lined with holm-oaks, vast prairies surrounded by woods and plants that formed square flower bed and sheets of water. For financial reasons the idea was reduced and the gardens were divided in two parts. According to the tradition, the english garden was born in order to satisfy queen Maria Carolina's wishes, wife of Ferdinand IV, who surely financed it with his personal patrimony. 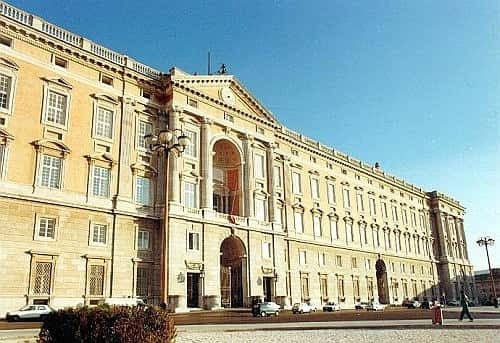 It seems that in reality it was lord Hamilton, "extraordinary envoy of her britannic majesty" to the Neapolitan court, to suggest the realisation of the garden, to the queen. He appealed to the rivalry with the queen's sister, Maria Antonietta queen of France, who had demanded a garden at the petit trianon of Versailles. The queen called the botanist Andrew Graefer, from England, who was one of the most famous gardeners of the kingdom. The garden offers a series of suggestive places, full of references to the models of that time: the cryptoporticus, with the statue originally from the excavations of Pompei and from the Farnese collection, the little pond of the Venus'bath, with the fake pompeian ruins, the "lodge in an English style" that was the home of Graefer and finally the beekeeping area used as a water tank by Vanvitelli, then used for the apiculture and then transformed into a greenhouse in 1826. The lodge destined for Graefer's home is a building composed of a ground floor and a top floor, that is presented prospectively like a big floor in which holds doric pillars, and matching frames, and decorated with medallions. The ground floor is composed of eleven liveable rooms in which you can access to through an open arched space exposed at midday. The top floor has six rooms in the front and six in the back, facing north. There is also an attic and a room destined for the storage of seeds and other equipment. Graefer continuously carried out excursion on Campania, Capri, along the coast of Salerno and to Palermo to re supply the garden with plants: those not planted were guarded in the four greenhouses, located near the lodge. Only one green house had a glass roof and was heated with hot and humid air, while the others were in brickwork. Near the green houses and the aquarium, large round pit divided in half to contain aquatic plants. also nearby a rose bed with numerous varieties of roses and the botanical school. Keeping in contact with the English botanists, Graefer was able to obtain specimens from Australia, China and Japan: thus explains the presence of the japanese camelia and other rare plants in the garden of Caserta. More a botanist than a gardener, Graefer created hybrids, collected exotic plants and seeds that would have made his garden a botanical orchid. In 1826 the beekeeping area became a green house with a neo classical hemicycle, that the recent restoration suggested should be used as "greenery theatre". The nymph lake extends in the centre and contains two islands, full of vegetation, a romantic symbolisation of nineteen century style: the largest has a small temple with granite columns and dolomites, from the ruins of Pompei; the smaller island has a pavilion for the refuge of ducks, swans and other aquatic birds that live near the lake. 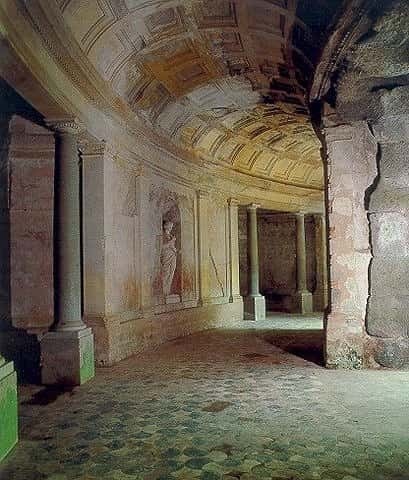 Full of romantic influence, the cryptoporticus is a false circular nynphaeum with tufa walls and large niches decorated with stucco and roman opus reticolatum, containing eleven statues from Pompei and from the Farnese collection, of which are on site from before 1792. The floor is in coloured marble, in two points the vault is uncovered and the walls have false clefts and cracks. From the roots af a large yew gushes the water that fills a small lake, Venus'bath, where the goddess emerging from the water is portrayed in a statue by Tommaso Solari, situated on rocks that divide the water in a thousand streams, leading to form a waterfall, then a river and a small spring from which begins a small lake. In this area, the vegetation is composed of plants that need shade, like ferns. 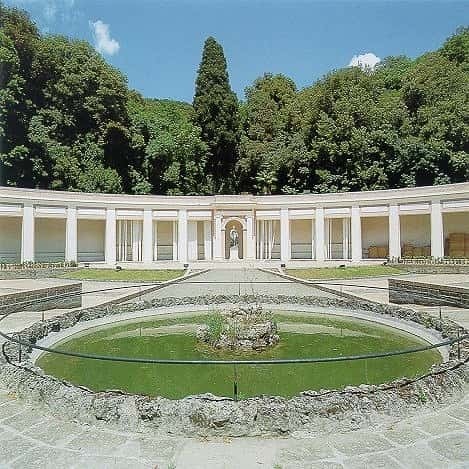 In the north part of the garden is situated one of the most spectacular structures, created by modifying a large unused tank, built by Luigi Vanvitelli many years before the arrival of Graefer. The tank, sustained by solid pylons, was placed on the top of a small wooded hill that was to be used in case of damage to the carolino water system; it was never used, and during the French era, became the site for the production of honey (hence the name "beekeeping area"). In 1826, during the reign of Francesco II, it was used for the flora, as a green house, for the cultivation of arboreal plants. Therefore the statue of Flora or Cerere, work carried out by Tommaso Solari in 1761, paid for by Luigi Vanvitelli. In this part of the garden is combined wit flowers and divided in five large plots of land, called scolle, for the cultivation of small and large trunk trees. The English garden of the Royal Palace of Caserta rises to the dimensions and to the quality of a real botanical orchid, rich as it is of flowers that represent a true rarity for the era in which they were planted. Here the more exotic species found the ideal arrangement, that favoured a luxuriant growth in only a few years, but that today present themselves as beautiful living beings that have perfectly integrated in their place of growth. The trees that create backgrounds line the boulevards and enrich the islands are eucalyptus, pine, yew, bay, cypress, gingko, biloba, magnolia, plane, oak and acacia. Ferns, water-lilies and bushes grow luxurious in the waters of the lakes and the fountains. Camellia' s, peonies, brooms, convolvulus and roses find a place in the cultivated lands. Finally, in the garden there are also beautiful specimens of palm trees on a hill, and cactus plants that grow near an antique peristyle, with columns and ruins from Ercolano.